Nonetheless, despite being a white Westerner, I have a great deal of admiration and appreciation for Shinto – and many aspects of Japanese culture – myself. And although I, personally, am not likely to reduce my book collection to thirty (yes, I realize Marie Kondo only stated that she herself only kept 30 books at a time, she was not decreeing it for everyone), I definitely recognize that I could benefit – both my living space and my head-space – from some pretty substantial de-cluttering! I have spoken before to the point that if their desire was truly for diversity and multiculturalism, they would do all they could to foster diverse cultures and peoples in their own historic and geographic context, not seek to mix them up all over the world (but of course, mostly in what have historically been European-majority lands). But just consider this one point: they claim they want “diversity.” European women (and men, too, of course) have a stunning diversity of hair and eye colours. Even of the two lovely young women in this picture, one is a dark blonde, the other a light brunette; it’s hard to tell from the pic, but I suspect their eye colors differ, as well. In the name of “diversity,” the Leftist lunatics want to import an ever-increasing number of people who, other characteristics aside, are uniformly characterized by black hair and brown eyes. Where is the diversity in this, I ask you? From Scandinavia to Sicily, from Ireland to Illyria, Europe has all the diversity it needs. And so do the rest of us! Please note: this is a study by a left-wing group! Even though they may be in ideological agreement with the pro-mass-immigration, enforced-multiculturalism agenda, even they are unable to ignore the fact that it is deeply unpopular with the British people: indeed, they actually tweeted out that 71% of Brits believe the sense of community in their area has deteriorated over their lifetimes. That is nearly three-quarters! 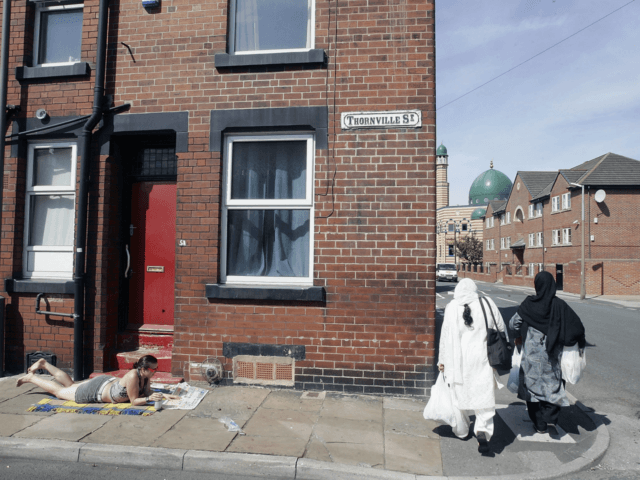 The study further noted that “A large number of Brits are also ‘particularly incensed by cultural pluralism, seen to be favoured over British values and traditions, and political correctness, regarded as taxing and repressive. '” This is, of course, the case not only in Britain, but throughout much of the West – including the United States, where the election of President Trump is an indicator of a significant push-back. In other words, despite its frustration and aggravation, and despite a massive influx of alien elements, Britain – so far – remains Britain: doughty, pugnacious, and determined, keeping a stiff upper lip. That, at least, is encouraging! All may not yet be lost, in “England’s green and pleasant land.” God grant that it ever remain so! And may God strengthen the hands of those seeking to keep Britain British. Rules are great and necessary, but the fact is, we’re disallowing boys to be boys. My answer to this question can easily be guessed by my readers, I suspect! This is an excellent short essay, perhaps all the more notable in that it is written by a woman, Annie Holmquist. By all means, please follow the link and read it! The voices (both male and female) pushing back against the über-feminization of Western society are growing in number and in volume, and that is all to the good. But there is still a long way to go. The culutural Marxists who seek to destroy what is left of Western civilization and Western Christendom are powerful, well-entrenched in dominant positions among our academic / educational, political, and media elite, and have learned well how to apply psychological and social jujitsu against a West which, by its nature, is predisposed to compassion, justice, and a laudable (within bounds) tendency to root for the underdog. Convince Westerners that you are oppressed, and they will bend over backwards to do anything they can to “liberate” and assist you – even to their own detriment! I don’t think any fair-minded observer can deny that the major groups which today’s Leftists portray as the bogeyman – whites, males, and Christians – made some serious missteps, and committed some serious abuses, in the past. But neither are we uniquely culpable among the world’s people; far from it! If our sins may at times seem more boldly emblazoned on the fabric of history, it is because there was a time, not so distant, historically, when we were both technologically and socio-politically dominant. Those days, however, are in the past, and falling farther astern with every turn of the screw. Nor is it justice to continue to visit the sins of the fathers – whether real or imagined – upon the sons, literally as well as figuratively, ad infinitum. Not only is it morally vicious, it is unwise. I am sure there are those on the Left who view the angst being suffered by boys and young men, especially those of European ancestry, through the lens of retributive justice; and who would like to think – or at least, hope – that white males will either somehow disappear altogether, or else at least lapse into a sort of voluntary dhimmitude, in which they accept their new, inferior, status as somehow their due. Something of the sort has happened in Germany, in the decades since the Second World War, due to feelings of shared national guilt (encouraged and exploited by the victorious Allies); but even there, rumblings of discontent are beginning to be heard. What goes around, comes around, and people can only be kept down for so long before they start to rebel – as Leftists, of all people, should have sense enough to realize from their own experience! To cite Germany again, one would think we would have learned the lessons of the Versailles Treaty, the Wiemar Republic, and the rise of the Nazis: perhaps the classic example of retributive justice gone awry, coming about as it did largely in reaction to the humiliation imposed upon post-WW I Germany by France, and to the ascendancy of the cultural Marxists’ political forebears in the former. The modern Left, it seems, is taking a page out of France’s book, c. 1918 – hardly a wise model, in my opinion. But I digress from the topic at hand, which is that boys need to be allowed to be boys. Human nature cannot be changed, on a fundamental level; those who try are doomed to disappointment. It can be educated; it can be refined; it can be channeled into productive, as opposed to unproductive, directions. But it remains human nature. And just as water boiling in a closed container will build steam-pressure until it finds the weakest point to achieve an outlet, if we do not allow boys natural-but-productive outlets for their boyhood – their maleness – they will find unproductive ones, and the situation for society will be worse than if they had simply been allowed to be boys. Be cautious, O “liberals”! As ye sow, so shall ye reap. But the harvest may not be what you expected! * As the article linked in my previous post indicated, the “gender gap” in higher education solidly favors women (41.5% male vs 58.5% female, across all degrees, or 141 degreed females per 100 males); people of color are out-breeding people of European ancestry by a substantial margin, both worldwide and in the West – including the U.S., where non-Hispanic whites are projected to become a minority of the population (47%) by 2050; and as to those who are “different,” be it in sexuality, gender, religion (or lack thereof), etc., one has only to be reminded of the dictum often attributed to Voltaire: “To learn who rules over you, simply find out who you are not allowed to criticize.” Whether Voltaire said it or not, there is considerable truth in the statement!